What does 'Open the Book' Do? 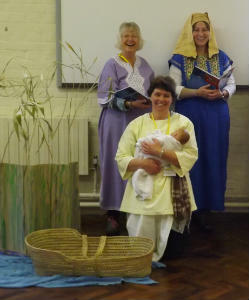 Our enthusiastic Open the Book Team at St. Mary's act out bible stories each Wednesday morning in term times in both the Junior and Infant schools in Horsell. Their aim is to make the Bible 'come alive' for the children by dramatising well known stories from both the Old and the New Testaments. 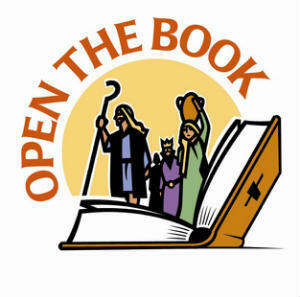 The Open the Book team uses drama, mime, a wonderful and very creative set of props, evocative costumes and audience participation from the children, to present Bible stories in ways that are lively, interactive, engaging and fun! Several children also get the opportunity each week to take part in acting out the story, which is followed by a short reflection and opportunity for prayer. This ministry is part of a national initiative which is currently reaching over 1500 infant and primary schools in the UK. 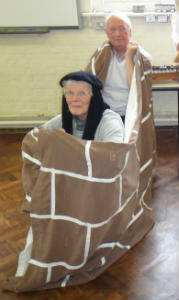 At St. Mary's we can't work out who enjoys Open the Book more - whether it's the team or whether it's the children! If you would like to get involved you would be very welcome. You don't need to have great acting skills - just a lot of enthusiasm! We meet on Wednesday mornings and you don't need to be there every week. You would be very welcome to join the team even if you are only able to be there once a month or so. We also welcome creative prop and costume makers. If you have a skill we can use it! For us at St. Mary's this is a real opportunity for one generation to tell another about the Bible in a very memorable and easily understood way. It is also an opportunity for us to work ecumenically as we have a number of members of our team who come from different local churches. Do come and join us if you can, just contact Marcus Brookfield (children@stmarys-horsell.org.uk). If you are a parent don't forget to ask your child about what story they had acted out on a Wednesday morning by the Open the Book Team.